Hi! How are you? How are the School holidays treating you? For us, the week has gone really fast. We 'moved' into town, currently house sitting for friends...Miss B spent most of the week up north, with my parents. She loves going to Nana and Papa's during the school holidays, even more so this time because our cat, Smooch is staying there until we move into our new home (details coming soon). This week, I have enjoyed some extra one on one time with Master M and have got a few 'Toddler" inspired posts in the pipeline...speaking of which, my post DIY Tool Bench (Guest Post by Grillo Designs) was featured this week on My Bored Toddler! Exciting! I am happy to be back on Instagram, taking photos for FMS Photo a Day and a few other pics along the way...I've been a bit slack about sharing them here, on the blog, but don't worry, I am planning on sharing a bulk post of Weeks 25-28 this week, so you will be able to see the photos I didn't get a chance to share on IG very soon. If you are on IG, I would love it if you popped over and followed me @charlene_ttmn. Say Hi and I shall follow you back! Watching: McDreamy's (Derek Shepherd played by Patrick Dempsey) last episode on Grey's Anatomy! I saw the spoiler alert last month and was gutted to hear he was leaving the show. They finally aired it here in New Zealand on Tuesday. Yes, I shed a few tears...next week I am definitely going to have a box of tissues next to me! Listening: to Silento - Watch Me (Whip/Nae Nae) - such a catchy tune, makes me want to bust a move! ha! I also came across this video of a little girl and her pregnant mama dancing to Watch Me on my newsfeed this week. It's awesome - Check it out! Making: Coconut Loaf - For the recipe, head over to Always Made With Love. It really is quick and easy...and oh so delicious! Had a cuppa and catch up with a friend I haven't seen in ages! Picked up a few things from the farm, mostly crafty stuff so I can work on M's PLAY Portfolio and Miss B can do some crafts next week. Dyed my own hair (I've dyed my own hair since I was 16 - such a rebel! Planning: on having a Mother/Daughter date on Tuesday while Master M is at care. We are going to watch Inside Out and then go to Glow in the Dark Mini Golf which is fairly new to our city. Thanks Mum for getting us a voucher. Should be a lot of fun! Loving: the #inthepicture movement created by Bron at Maxabella Loves. 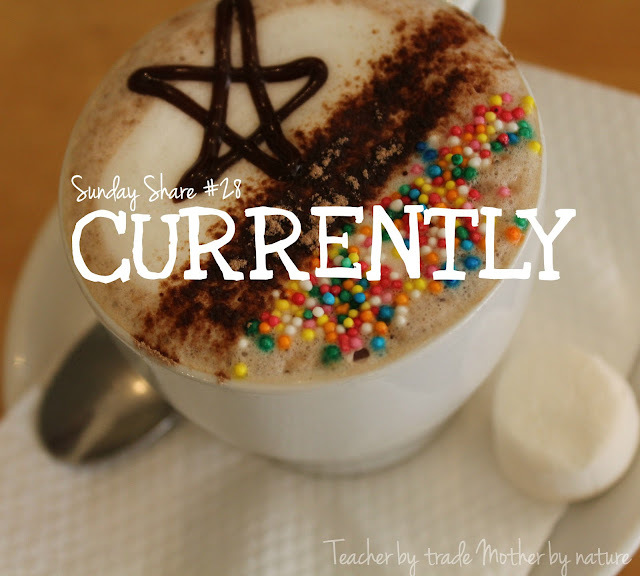 This week I shared a few photos of me with the kids...and my Mum - See my post here. Next month, I hope to share a photo of my Dad getting in the picture too! Watch this space. What have YOU been up to? Choose two words from the list above and tell me what you are currently doing! I've been a bit quiet on the blog this past month, due to all the moving...I hope to be back to regular posting soon!